Max has been in my life for almost 12 years. We bought him when he was an 18 month old stud colt. We had him gelded and then broke him when he was 2. My parents told me that I probably wouldn't be able to ride him until he was 5 or 6 because I was 13 and they were afraid that he wouldn't be well behaved. Well, that didn't last long because I rode him the first day he had a saddle on his back. He is completely dead headed and wonderful. Since I have had him, Max has been a pet therapy animal (he has gone to nursing homes & schools) as well as an accomplished show horse. 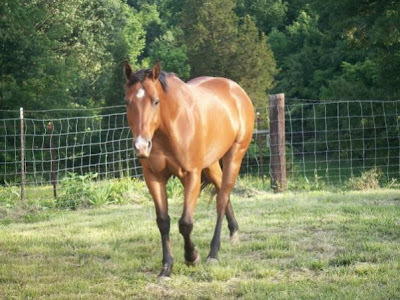 As a 3 year old, he was Kentucky 4H Reserve State Champion in their snaffle bit futurity. He was also KY 4H Res. State Champ in showmanship my last year. There were over 40 kids in the class. He also has points in the American Quarter Horse Association. 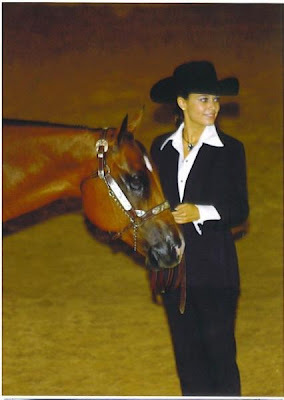 Winning the circuit championship in Showmanship for the WTQHA Summer Circuit! More than that though, Max was a great buddy for me. He and I know each other inside and out. I really feel that he has complete trust in me and I know that I have it in him. I miss him terribly as he was always my stress relief and I can't have that with him now. He lives with my parents at their house until I can find a way to keep him here. Well, since we're posting pictures, I have to post this one too. 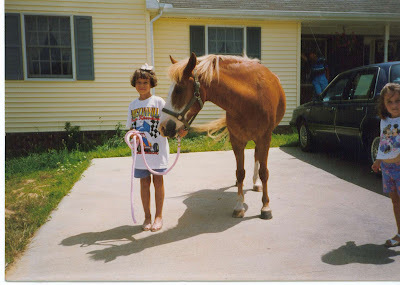 This is Lightning and he was my first horse that I got for my 8th birthday. I'm sure that my parents regret buying him - ok, probably not, but it sure cost them a ton of money in the long run!!! Hope you guys have a great day! I will have to give Scooter her own post in the next few days so that she doesn't get sad :( I'm so glad to get to see her and my hubby tomorrow!